I've heard of Korean Circle Contact Lenses a while ago but never got a chance to try it. The reason is simple, I had to throw out about 6 pairs of Freshlook before because it irritated my eyes when I wore it. This was over 5 years ago and I haven't touch another pair of contact lens ever since. Although I always wanted to try circle lens due to the hype that it makes the iris (inner circle) of your eyes appear rounder & larger. In results, your eyes will appear bigger, sexier, and more alluring; that it will capture all the hearts and souls of the bystanders....well, ok I added the last part but you get the point. I think contact lenses really enhance your overall look. Make you look more interesting rather than dull & boring. What do you think? You can get these contact lenses at SGLENSES. There are more colors and choices to choose from. So go check them out!!!!! ***There are always positive and negative side affects of wearing contact lenses. Please check with your optometrist first to see if these are safe for you. ***Your eyes are very fragile. Remember to take special care of the lenses before, during, and after wearing them. Check out Clear Care. I'm using it to clean my contact lenses. It's the best way to clean and disinfect your contact lenses. Have fun guys! Wearing contact lenses is fun but protective measure is always a must! twin! You look stunning! If I see you in person, I'd probably drop dead and take 2nd 3rd and 4th looks to you! wonderful eyes! You are pretty to start with but these lenses made you a MODEL!!!! Love it!!! so pretty!! :D i have a pair and love the way the contacts make my eyes look. sadly the contacts make my eyes feel like they're suffocating. i can manage about 1 hour before i get fed up and take them out >_< hopefully you find yours more comfy! Very puurrty contacts! I've never worn contacts before because I have this fear of touching the white part of my eyes...hahaha. Strange I know! but seeing all you lovely ladies sporting 'em, i will definitely try it out for sure. You look pretty as always. You DO look like a doll! Those contacts look amazing on you! LOVE IT! And Clear Care is a very good contact lens solution. Ever since I started using it, I haven't had any problems wearing my contacts. i think you naturally have very pretty round eyes... i like the blue lenses on you best!! you're so damn gorgeous! i love ur cheek bones... and this is bb cream on ur face? nothin else? geez i wanan try it out but im not that light skinned.. so dont kno which one to get.. im like medium beige.. not light skinned nor am i dark.. wut do u recommend? have you worn them all day...are they comfy enough to wear them all day???? pink brought up a good question, are they comfortable for all day wear? love the blue ones on you! you already look amazing w/out them! your eyes already look huge! but the blue is VERY nice on you! Ive been wanting them for a loooong time! LOL! How much are they?? I so want one! Did the delvery took forever? :/ I'm just scared to use cricle lenses but they are too pretty! They all look beautiful on you! I agree! Clear Care is the best!! Awww you're gorgeous w/and w/o colored contacts! I'm loving your hair! Geez I hope I"m able to do that once my hair grows out haha. i like the blue ones!! the lens look great on you.. i have some similar ones except they are prescription! With contacts, I'm a little afraid of you. Sorry for my english, i'm french. ooOoo look at you, but you're gorgeous to begin with -- so with lenses or without. still hawt. and your my boobalicious sistren!!! and thanks for the konad links -- hopefully I'll have some luck with my kit -- I ordered the konad II kit and one french manicure stencil sheet from www.wowiscool.com, hopefully it'll work in my favor -- toss your kit my way if don't need, LOL or I'll purchase it from you. Woot! Allan sent me a couple pairs too can't wait to finally try em! ooh.. i can't stand wearing contacts.. :) just ask nikki. hehehe! :) but your eyes look gorgeous here!! ur hubby must be all over you all the time.. hehehehe! those are pretty lenses! you look so pretty without them too! You are naturally beautiful and don't contacts. It's not by any means an insult, but it's true. If they make you feel pretty, that's wonderful, but don't feel like you have to wear them. Hideous! The blue ones look so unnatural. They don't look real at all. The green ones look a bit better. I think your natural eyes bring out your features more beautifully. The contacts make you look alien like. I love how they make eyes appear bigger!! BUT they do irritate my eyes occasionaly. After a few hours of wearing them I have to take them out because my eyes were watering so bad and feeling very sore. I try not to wear them too often as I don't want to damage my sight. 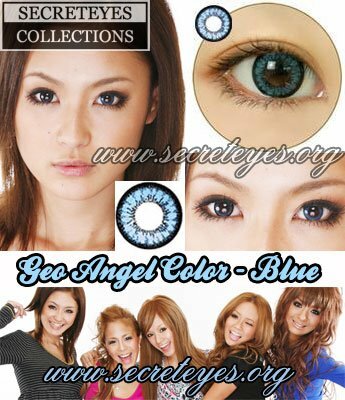 I am selling GEO lens for $17/pair. Offer will be good until 07/10/2009. ALL return customers receive 10% off for future orders. I will be placing the orders on 07/10/2009. Please check out my site if your are interested. Glamorouseyes.webs.com. you shouldn´t use those lens, you don´t need them! your natural eyes look beatiful, you look better without lens, think about it ;). natural is always better. and i don´t like how that lenses look, thy are so unnatural. and you ve got pretty eyes! u should aprecciate them! í´m a honest girl! believe me, apreciate your own eyes. This lens really look good on your face. You look beautiful with circle lenses on. I usually get mine from www.LensCircle.com because I don't trust in private sellers. They work great. Try them out if you have the chance. It is certainly interesting for me to read that blog. Thanx for it. I like such themes and anything that is connected to them. I definitely want to read more on that blog soon. Hey there it's me tina!! funny thing, i was looking online to see where I can get cheap circle lens here since I live in Korea. and I was thinking HMmmm i wonder if this is a product you'd like... and the 1st link I saw and clicked on was your eblog! hahaha guess you've tried them! well, regardless, the circle lens here are way cheaper than the ones sold online or in CA so i think i'd be content, but i sure don't mind looking for super cheap deals! well, have a blast blogging! Green contacts make you look like a gecko, or some kind of amphibian. I have the Geo Super Angel Violet's.